“Greg” is Greg Heffley, perpetually stuck in middle school, as he puts it, “with a bunch of morons.” He's always being embarrassed by his parents, and he's got two awful brothers: the nasty older one, and the tattle-tale toddler. Greg is a very nervous, sneaky, fearful and bullied and bullying protagonist. “I was an average kid, but I had very wimpy moments,” he replied. Jeff Kinney grew up outside Washington, D.C., dreaming of becoming a cartoonist. He actually created a successful comic strip, called Igdoof, for the University of Maryland's campus newspaper. An “Igdoof” strip by Jeff Kinney. He got a day job designing online games. Then on the side, he started writing and illustrating “Diary of a Wimpy Kid. He worked on that draft for eight years. Still, in 2006 at a comic book convention, he showed a short excerpt to an editor from Abrams Books, mostly known for its elegant volumes on art. 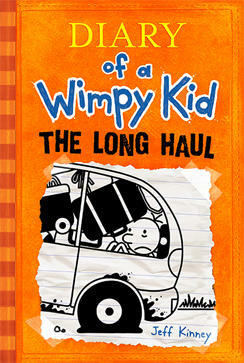 But when “The Wimpy Kid” was marketed to a young audience, it took off beyond Kinney's wildest dreams. Nuts or not, Julie and their sons, Will and Grant, seem to take it all in stride — even the fact that Jeff has been an executive producer of three films based on the series. To stay close to his readers, Kinney travels all over the country, turning up at places like Edward Molin School in Newburyport, Mass., where everyone seems to be a fan.